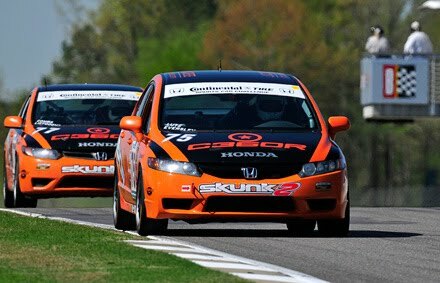 BIRMINGHAM, Ala. (April 10, 2010) – Compass360 continued its run of podium finishes in 2010, with Ryan Eversley and Zach Lutz garnering a third-place result in their #75 Honda Civic Si Saturday at Barber Motorsports Park in Alabama. For Eversely and Lutz, the third-place run was their career-best result in the Continental Tire Sports Car Challenge Street Tuner (ST) class. Starting fifth, a strong run from Lutz and quick pit action from the Compass360 crew moved them ahead of teammates Lawson Aschenbach and David Thilenius, and just ahead of a multi-car scrap for fourth. For the Compass360 team, this weekend’s result backed up a victory at Daytona and a second-place finish at Homestead-Miami Speedway – both for the #74 Civic of Aschenbach and Thilenius – to make it three podium finishes in as many races this season for the Toronto-based team. With their hard-fought fourth place in Saturday’s 200-mile run at Barber, Aschenbach and Thilenius continue to hold a 10-point lead the ST Drivers’ Championship standings. 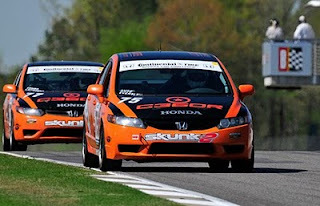 Honda sits atop the ST Manufacturers’ points battle, while Compass360 continues to lead the Team title fight. Next up for the Continental Tire Sports Car Challenge will be Round 4 in the championship, a 2.5-hour race April 24 at Virginia International Raceway in Danville, Va. I spent a bit of time on the west coast of Florida as a kid, so I always like going back to St. Pete. I also know what a typical Gulf coast rain shower is like, so I knew what we experienced on Sunday was most decidedly NOT a typical Tampa Bay “2 p.m. shower”. Still, it was a great weekend all-in-all, with great crowds, great atmosphere, great racing and great weather … at least on Friday, Saturday – and Monday. And for an open-wheel racing geek like me, it was near Nirvana, with just about every U.S. professional single-seat race category included: F2000, Star Mazda, Indy Lights and of course the IZOD IndyCars. All that, plus the Acura Sports Car Challenge, second round of the SCCA World Challenge Series that features the Acura TSXs (or should that be TSXi???) of RealTime Racing and another half-dozen Honda and Acura teams. You can check out the stellar results they posted over the weekend at their blog (Real Time Acuras Sweep St. Pete x2). 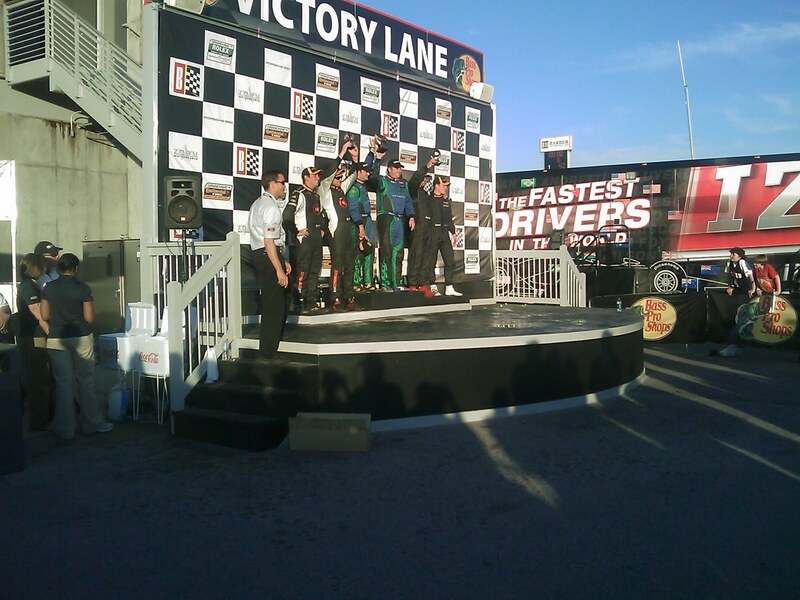 This weekend marked the debut of the IRL’s “entry level” series for young drivers, called the USF2000 Series. The series is based on the existing “semi-pro” F2000 Championship (an SCCA series running in the Northeast and Midwest US) and Pacific F2000 Championship (run, obviously, on the West Coast). USF2000 uses the same cars, but with bigger (spec) brakes, a revised (and also spec) wing package and with teams “encouraged” to run two-liter Mazda MZR engines in lieu of Ford Zetec and Pinto engines. Just over a dozen drivers and teams took part in a pair of races – one each on Saturday and Sunday. A good F2000 weighs just over 1,100 lbs, uses a spaceframe chassis and makes 175 bhp. The wheels are 6” wide in front, 8” in back and the cars all feature wings and underbody diffusers (downforce-producing tunnels). Most teams are quoting season costs of $225,000 - $250,000. Just for comparison purposes, a Honda-powered FF utilizes the same chassis as its larger F2000 cousin, but minus the wings, diffuser and with narrower (5.5 inches all-round) wheels. The absence of aero parts and shorter travel distances make a full season of SCCA FF racing, even with a professional team, considerably less expensive than F2000: $60,000 - $100,000, even with LOTS of testing. (I also think the absence of wings makes FF a better initial training series for karting graduates – but that’s another topic). Running for Andretti Autosport, a 15-year-old named Sage Karem – who hails from Nazareth, PA, no less -- qualified on the pole both days and won both races in a walk. His margin was a huge 14 seconds on Saturday, and was almost as large on Sunday. British FF graduate Patrick McKenna finished second on Saturday, while teammate (and British karting grad) Josh Fielding was best of the rest on Sunday. But neither were really in the same zip code as Karem at the checkered. Andretti will be running a second 15-year-old, Zach Veach, starting with Round 2 at the O’Reilly Raceway Park half-mile oval in May. Jeez, kids today…. With the demise of the once-great Atlantic series, Star Mazda is now the next step up the motorsports ladder from FF/F2000. The series even uses standing starts on road courses – just like Atlantics. And the current, state-of-the-art Van Diemen carbon-fiber chassis was originally developed as a proposed Atlantic design, before being adopted by the Star Mazda series. The rotary Mazda engines in these cars make around 250 bhp; and they run on slightly wider wheels: 8” in front and 10” in back. Wings and tunnels are bigger, too, but the car still weighs about 1,200 lbs. A full season of Star Mazda, which includes events from coast to coast, will cost you around $350,000-$400,000 with a quality team. At St. Pete, the Star Mazda cars were running about 4-5 seconds a lap quicker than the F2000s. Speed costs money. How fast do ya’ want to go? Conor Daly, son of former F-1/IndyCar driver Derek, is now in his second year with the series, and backed up his third-place finish at the Sebring season opener with a win from the pole in St. Pete. It was a healthy field, with 22 cars, almost all of them being run by professional, multi-car teams. Just like Karem, Daly got a great start and almost immediately began gapping the field. But a couple of full-course cautions bunched everyone back up again. Still, at the finish Daly had a bit over five seconds in hand over second-place finisher Joao Horto, a promising rookie out of Brazil (quelle surprise, eh?). 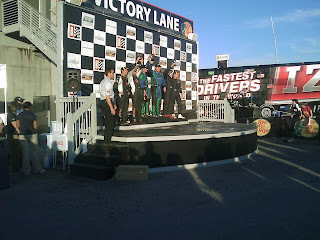 The win also gave Daly the early-season points lead. Next up – and the final stop before IndyCars, -- is the IRL’s Indy Lights series. Here again, we have a bit more of everything compared to the Mazdas: more power, more tire, (just a bit) more aero, more weight and more cost. Like its larger cousin, the Dallara Indy Lights chassis is getting a bit long in the tooth, and the Nissan-derived V-8 lump in the back is very old – and very heavy in the bargain. The gearbox is equally nasty, old, and heavy; but at least it has a paddle shift. At St. Pete, the 420 bhp Indy Lights cars were only about two seconds quicker than the Star Mazdas, and a full five seconds slower than IndyCars. You can run a full season of Lights for as little as $450,000, but a top-ranked team will spend upwards of a million per season. The Sunday race started under a light shower – you could see that much heavier rain was in the offing -- and it was a very short race for the two Canadians in the field. Phillip Major started ninth, and got a great jump, passing several cars. But then he got too greedy, braked far too late for the first corner and drilled pole qualifier, fellow Canuck, and his Indy roommate, James Hinchcliffe. Oops. “Hinchtown” was done. The field restarted on Lap 4 as JK Vernay quickly passed a fading Sebastian Saavedra, and kept the lead after the field was red-flagged to change over to rain tires. Vernay was impressive in the wet, as was former CART regular Jan Heylen, making his open-wheel racing return with Team E. Another returnee, Junior Strous, looked to be Vernay’s strongest competition in the early laps – until he eventually tried too hard and spun himself to the back of the field. Funnily enough, all these guys – Vernay, Heylen and Strous – are either Dutch or Belgian. It never rains in northern Europe, right???? Another “mudder” was also having a great race. Driving for Friend-of-Honda Bryan Herta’s Lights team, Stefan Wilson (the younger, but no shorter, brother to IndyCar’s Justin), had been very quick on Friday, then ruined his qualifying by finding the wall. Redemption would come in the race, as Wilson climbed from DFL (dead freakin’ last) on the grid to third at the checkers, behind Vernay and Heylen. Dr. Peter Venkman: Or you can accept the fact that this city is headed for a disaster of biblical proportions. Dr. Raymond Stantz: What he means is Old Testament, Mr. Mayor, real wrath-of-God type stuff. Fire and brimstone coming down from the sky! Rivers and seas boiling! Dr. Peter Venkman: Human sacrifice. Dogs and cats living together. Mass hysteria! As I said at the top of this piece, this wasn’t a typical Tampa Bay in-and-gone-in-an-hour afternoon shower. This was Wrath-of-God time, with thunder, lightning, pouring rain and the aforementioned dogs and cats living together. But for all that, two things kept us from racing on Sunday: the lightning (a threat to fans in the stands and corner workers alike) and a flooded race surface –up to four and five inches deep in places, after storm drains backed up – that even rain tires couldn’t handle. In less than eight months, Will Power has gone from injured, part-time substitute to a dominant early-season points lead. Hollywood couldn’t come up with a better script, and it couldn’t have happened to a nicer guy. Now, just like Scott Dixon a few years ago, he just needs to learn to be more outgoing and trade some of his natural laconic “Aussie-ness” for a bit of Castroneves’ swagger. Justin Wilson finished second, once again putting many better-known drivers and larger teams to shame. He’s definitely among the “best of the rest” right now, and could, just maybe, become a darkhorse championship contender if Power stumbles. It wasn’t the “drive of the day” (his early spin put ‘paid’ to that) but Dario Franchitti definitely had the “recovery of the day”, bouncing back from both the aforementioned Lap 1 driver error/spin and mid-race cut tire to thrill the crowd over the last dozen or so laps, passing at least one car each lap and he charged his way back up to fifth. Awesome stuff to watch. Marco Andretti charged to the front early, but then faded and never recovered. Meanwhile, Ryan Briscoe and Danica Patrick both came from nowhere to net decent finishes – Briscoe by using alternate pit-stop strategy and yellows to jump ahead of quicker drivers and “steal” third place; and Danica likewise doing a stealthy job of staying out of trouble and sneaking her way into seventh. Alex Tagliani gave his still-new FAZZT guys another strong weekend, but this time netted sixth for his efforts. Scott Dixon, on the other hand, has dug himself an early-season hole, clipping the wall here (at least the second time he’s done that) to end his day early. Unluckiest team? Again, no contest, it’s KV Racing. In addition to Moraes serving as Wheldon’s pin-cushion, there was Takuma Sato’s crash attempting to keep ahead of Vitor Meira (that’s three big crashes in just two races, if you’re keeping score). So far, E.J. Viso has been the team’s “steadying influence”. Think about THAT for a minute….. Adding injury to insult, Moraes was in pain all weekend with a cyst behind his ear that made just putting on his helmet an excruciating experience. He had it surgically removed this past week. Let’s have more races like this one, but on Sunday, please. Expect Ryan Hunter-Reay to run the entire season. He’s gotten off to too good a start to quit now. As expected, Andretti Autosport also has announced that John Andretti will drive the team’s fifth entry at the Indy 500. From the “karma can sometimes be cool department” comes the news that Bruno Junqueira will drive the second FAZZT entry at Indy, a big “thank you” from the team for Bruno’s assistance in qualifying the car that Tagliani drove to Indy rookie honors last year. We will run down the full Indy 500 Silly Season in the next update. Look for AT LEAST 40 legitimate driver/car combinations this year. I’ll be disappointed if the total is any less. Graham Rahal now will drive for Sarah Fisher Racing at both Barber and Long Beach. Will we see him in a second Newman Haas Lanigan car from Indy onward? The deal’s not done yet, but hopefully will be soon. Finally, reigning Indy Lights champ JR Hildebrand tested with Marco Andretti's #26 team this week at Barber. Somebody give this guy a full-time ride, soon.